On February 15th of this year, we included the note further below in our client newsletter, on how to be ‘smart money’ during a market crash. Let’s provide context by showing the opposite of smart money. We wrote our note because a handful of clients who had taken fright at the falls of January and early February. Two insisted, despite our advice, on completely cashing out of their holdings immediately including one who exited literally sold on the day the market bottom as it turned out. This was despite our advice to go extremely bullish on February 7* because there were bargains everywhere and to stay the course. It’s hard to make money selling at the bottom. I wish I could say that these two clients were unusual but every year a small percentage of people in our firm and thousands of investors around the world do exactly the same thing. So the simple answer to whether you are dumb money or smart, is how do you react to market falls? Do you get excited to look for opportunities from the panicking masses. Or are you one of the many that are panicking? 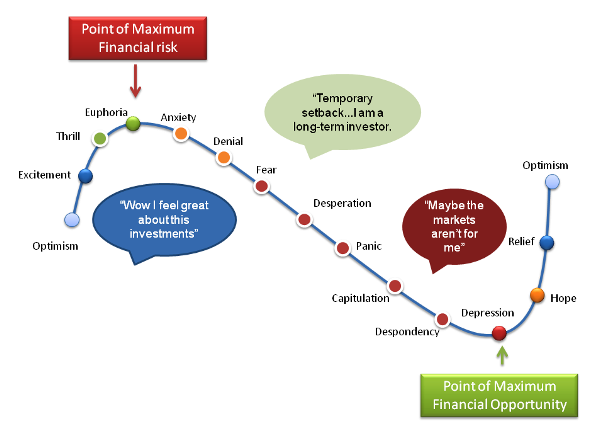 If you can stay logical during a market panic, then you are well on the way to being smart money. Here is our quick note on how to stay calm and logical in a panicking market. The natural human response to bad news is to ‘fight or flight’. Bad share markets and blaring headlines can also prompt this adrenaline fueled response. The consequence however of running and hiding until the coast is clear makes sense when faced with mountain lions but makes little sense when faced with a falling stock market. The key, as Warren Buffett once pointed out when asked about his advantage (I’m rational, that’s it), is to remain unmoved by emotion as much as possible and make decisions based on the fundamentals. 1. See market falls as opportunities. Get greedy when others are fearful. Market falls make people forget good sense and great companies can be bought cheaply. Right now we are buying several strong companies that are the cheapest they have been in years. 2. Know what sectors/companies have good strong and stable earnings in all conditions. You want something that will retain its value even if a crisis comes. Remember you aren’t buying a stock but a company, so think about it in those terms. 3. Know what constitutes good value and stick to it. You don’t need to know every ratio, but understanding that a single digit PE ratio with a book value of below 1 and a dividend yield of above 3% in a good sector, see above, is a very good start. Many people want to know “the right time”, but that is unknowable. What is possible is to know is what is a solid company at a great price. Focus on that and the timing will take care of itself. 4. Be prepared to act in advance. This is the part that many people, with their busy schedules will struggle with, but opportunities often don’t last too long. Know in advance what you’ll buy. 5. Make sure you have some cash to invest (or bond funds to sell). We like to have diversified portfolios for even the most aggressive clients. When equity markets are high and we can’t find anything to buy at a good price, we return to at least 20% in cash/money market funds. Sometimes it can take months or even years, but when we invest this money it will be for the right thing at the right price. Or you can think of it as being fearful when others are greedy, just as Buffett always says. Since then, the S&P 500 is up about 12%. The market isn’t panicking now, but the next fall will happen sooner or later and it will be much the same. Time to plan your approach now. Are you ready to be smart money next time? * Yes, we have the trading record that confirms this.